buttahnut squarrrrsh. you are terrific. time to get roastin' y'all. i have a lot of good things to say about squash. jeeeeeeez squash is such a versatile seasonal delight. its so great in so many capacities. savory or sweet - squash is an amazing little gourd to have around during these cozy fall times. i've put squash in thai curry, made the classic 'ol pumpkin purée, and shoved 'em full of various tasty toppings. and now a fabulous squash bread! mmmmmm it was sooo goooooD. it's long gone, but just seeing the photos makes me feel warm & toasty and i can smell it nowwwww. you can roast the squash in advance if you'd like the bread to come together more quickly. puréeing it right after roasting is probably the easiest method. then store it in the fridge til you're readyyyy. can you even believe that amazing color of the purée?? so prit-dee honeyyyyy. ...and the green of the pepitas. love. THIS bread. is perfeeeeeect. 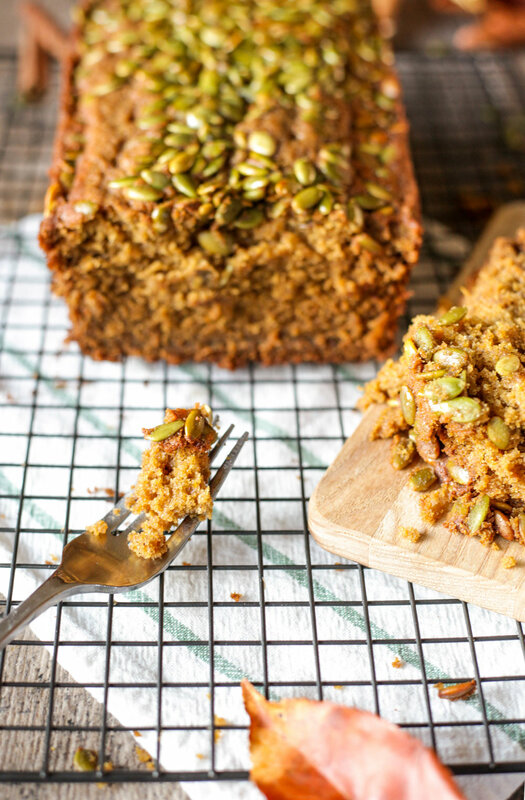 so warm and spicy and moist and ..... everything you want and need in a cozy fall bread. just look at that fluff. all spicy and well on its way to being a delectable bread. the SMELL! holy moses. so good. i want to bottle it up. i don't often buy pastries from starbucks since i worked there for so long, but their pumpkin bread is really good and calls to me. i was soo happy that this squash bread turned out just as scrumptious, if not MORE scrumptious than the sbux bread. i added some extra spices because i wanted this to be packed with warm spicy fall flavor. i call this a great success. i should have avoided placing the pepitas in the center of the loaf because it got kind of heavy and caved in a little bit, but thats ok. just press them nearer to the edges of the loaf and all will be groovy. i used butternut squash for this recipe because its a tad sweeter than other squash, but you could use pie pumpkins or try out other types of squash, too! and use any leftover roasted squash in your next meals. i recently had some butternut squash, black bean & cheese enchiladas...and yum. so versatile, i tells ya! i stand by you, squash. *To roast the butternut squash, preheat the oven to 425 degrees F. Halve the squash and remove seeds. Rub skin with coconut oil, butter, or veggie oil. Place in a baking dish with 1/2 cup water in the bottom. Prick all over with a fork. Roast in the oven for 20-25 minutes or until softened and browning. Let cool and scoop squash out of the skin. Discard skins. *Add the roasted squash to a food processor or blender. Pulse with 2 TB water, adding 1 TB at a time until its formed a smooth purée. Set aside. *You can roast & purée the squash about 3 days in advance to save time when making the bread. To make the squash bread, Use 1 tablespoon of butter to liberally grease the bread baking pan. Preheat oven to 350 degrees F. In a stand mixer or with electric hand mixer in a large bowl, cream the butter, sugar, and oil. Add the butternut purée, eggs, and vanilla, mixing as you go. Slowly add spices and flour mixture, mixing in between additions. Add 1 TB milk, scrape down the sides of the bowl with a spatula and mix once more. Pour batter into baking pan and shake until evenly distributed. To toast the pepitas, heat 1 TB butter in a pan over medium/low heat. Add the pepitas, maple syrup, and nutmeg. Gently toss for a few minutes until fully coated and browned. 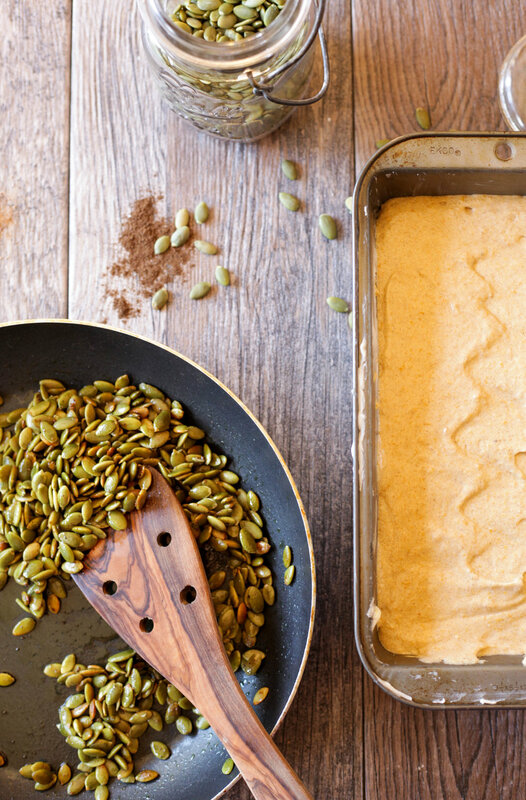 Gently press the toasted pepitas onto the top of the squash batter, avoiding the direct center slightly. Lightly tent the pan with tin foil (to avoid burning) and place in the oven on top of a baking sheet. Bake for about 70 minutes. Check the center of the bread with a toothpick at 60 minutes. The toothpick came clean for me around 70 minutes.